As 14 alumni judges entered Mairs Concert Hall at 4:30 on Friday afternoon, led by Macalester’s own bagpiper, the seventh annual Macathon officially kicked off. This year, about 100 students on 19 teams competed in the nonstop overnight innovation and creativity competition, held in the Olin-Rice Science Center and the Idea Lab. Teams had 24 hours to identify a problem or need, come up with an innovative solution, create a prototype, and present it to a panel of expert alumni. As in years past, the alumni-mentors were brought in from all over the country, representing experience in technology, software development, start-up, and marketing fields. 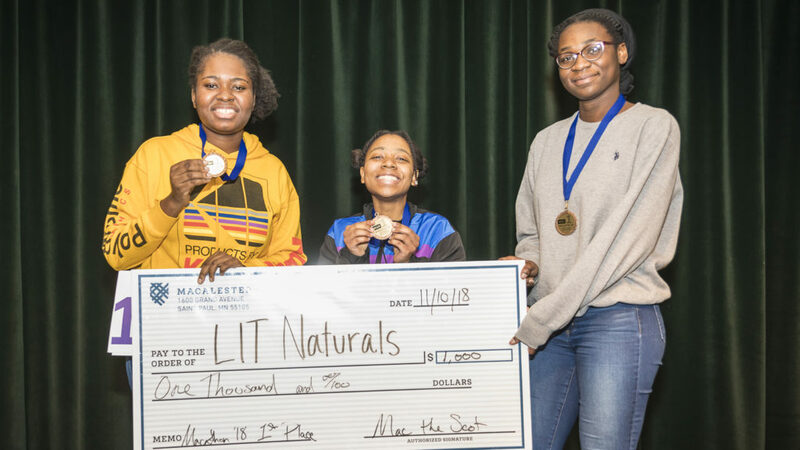 In addition to the three cash prizes awarded to the winning teams, Macathon experimented with a new prize this year—a $250 “Keepin’ it real” prize. Supported by Dave Mao ’97, this prize was created to reward a team focused on solving a critical issue happening off-campus in the wider community. At dinner following the kick-off event, teams were excitedly brainstorming ideas and even debating the best sleep shift schedule. Team Jeff with a G considered the pros and cons of sleeping in 4-hour shifts vs. following the 90-minute REM cycle. Meanwhile, team W.A.V.E. brainstormed while playing basketball, sharing an idea with every pass. Throughout the night, alumni-mentors ranging from the class of ’82 to ’18 visited teams to observe and give constructive feedback as they refined their ideas. “We didn’t sleep. We kept ourselves up with candy, energy drinks, and Diet Coke, and played loads of music too,” says Sagoe. In the Idea Lab around 8 a.m., L.I.T. Naturals started working on their hair cream formula and building hair elongation plates from perler beads and rubber bands. They spent the whole morning testing before the 1 p.m. first-round pitch—just minutes before, they finally tested the products with success. Advancing through the round, the team made it all the way to the finals, where they beat out five other teams to take the top prize. With their prize money, L.I.T. Naturals plans on investing in more ingredients and research to further develop and improve their products—but first they will catch up on sleep and let the reality of winning sink in. Second place ($750): Bazigar (Zachary Skluzacek ’19, Gus Walsh ’19, Aman Rai ’19, and Muhammad Haroon ’19) with “Jacket-Pants,” rip-off cold-weather pants made from repurposed clothing for conveniently changing from extreme cold weather outside to warm temperatures indoors. Third place ($500): Big Mac (Doan Khanh “DK” ’20, Kieu-Giang Nguyen ’20, Daniel Lim ’20, Paul Heo ’20, Peace Im ’19, and Isaac Liu ’19) with “Auditus,” a mobile app that features video-calls with live text and voice conversion for people with hearing or speech impairment. “Keepin’ it real” ($250): The MACademics (Sophia Oldfield ’22, Rachel Percy ’22, and Eva Stromgren ’22) with “Pack Hut v.1,” a portable and stand-alone tent-and-backpack combo for urban transient homeless communities in the Twin Cities. Check out some of Mac's most interesting stories from the past calendar year! This weekend, roughly 100 students competed in Mac's 7th-annual overnight innovation contest. Junior Samuel Fleming brings together his love of art with his economics major. Over the course of 24 hours, 11 teams strove to create original artistic performances for a chance at a $1,000 prize in the first-ever MacroBurst contest. Mac’s annual innovation contest challenges students to devise solutions to real-world problems.